This week, one of Pope Francis' most trusted confidants, Archbishop Víctor Manuel “Tucho” Fernández, author of Heal Me With Your Mouth: The Art of Kissing, and an alleged ghostwriter of Amoris Laetitia, published a stunning defense of adultery in Medellín, the theology journal of the Latin-American Bishops’ Conference, in an essay entitled "Chapter VIII of Amoris Laetitia: What is left after the storm". Key to Fernandez's argument is the pope's approval of the Buenos Aires guidelines on AL, which the Vatican recently published on its official website. 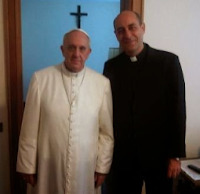 In an article that provides key insights into the mind of Pope Francis, Fernandez compares adultery for the divorced and civilly remarried to self-defense, as allegedly exceptions to the general norm. Indeed, Pope Francis has spoken twice of alleged conflicts between the Fifth and the Sixth Commandments with respect to justifying the use of condoms. Moreover, Fernandez argues that the magisterial "flip-flops" at Vatican II on religious freedom and salvation outside the Church set precedent for Pope Francis to contradict his predecessors in Amoris Laetitia. What follows is the full text of Msgr. Fernandez' article in an English translation by Andrew Guernsey. When interpreting the eighth chapter of Amoris Laetitia, particularly as regards access to Eucharistic communion for divorcees involved in a new relationship, it is worth starting from the very interpretation that Francis himself did of his own text, categorical in his response to the Bishops of the region of Buenos Aires. Francis proposed a step forward, which implies a change in the current discipline. Maintaining the distinction between objective good and subjective guilt, and the principle that absolute moral standards do not admit exceptions, differentiates between norms and their formulation and specifically calls for distinctive attention to mitigating constraints. These are not related only with the knowledge of the norm but especially with the real possibilities of decision on the part of the subjects in their concrete reality. Francis admits that a pastoral discernment within the scope of the “internal forum”, attentive to the conscience of the person, may have practical consequences in the manner of applying the discipline. This novelty invites us to recall that the Church can really evolve, as has happened in history, both in our understanding of the doctrine and in the application of its disciplinary consequences. But in order to apply this in the topic under consideration requires we accept a new logic without rigid structures. However, this does not imply a rupture, but rather a harmonious development and a creative continuity with regard to the teaching of previous Popes. Key words: Divorced in a new union, conditions, Amoris Laetitia, Chapter 8, moral standards, discernment, Pope Francis.